Argon is colorless, odorless and tasteless. This substance is known as one of “nobel” gases because it does not react with the rest of the materials and does not form a known chemical composition. Argon is inflammable and non-combustible and is not safe for life. Argon gas is heavier than air and dissolves in a small amount in water. When the argon is sucked and then heated, it consumes a lot of heat and is therefore an ideal cooler. Argon exists in the atmosphere, with a concentration of approximately 1%. Argon is recovered from the air in the air separation unit (ASU), where it is separated as a cryogenic liquid at a temperature of -308 degrees Fahrenheit. The material is then dispersed in the form of a cryogenic liquid or gas in the cylinder. Argon has various technical and economical applications and the inert feature of argon as a protective gas is used in many different processes (such as high voltage welding) to prevent the oxidation. Oxygen, nitrogen and argon are recovered from the air by a coolingmethod developed by Carl Van Linde hundreds of years ago. Small particles are taken from the air and then compressed and cooled. Water, hydrocarbons and carbon dioxide are taken. Through other processes, air is converted to liquid and gases are separated by distillation method. The device is called air separation unit (ASU). Most of ASU are constructed by Linde Engineering Department. Argon has various technical and economical applications and the inert feature of argon as a protective gas is used in many metal processes (such as high voltage welding) to prevent oxidation. Argon gas is used to fill fluorescent and filament lamps as well as being used as insulating gas for windows. Argon is used in many industries such as a the contaiminating gas to eliminate impurities and create a protective sheildagainst pollutants such as oxygen, nitrogen and water. Argon is odorless, colorless, tasteless and harmless, and therefore it has no alarming feature. Human has no sense in detecting the presence of argon. Contact with argon may cause frostbite or skin rash, changing the color of the skin to gray, white, and may cause blister. No harmful digestive effects are expected, but argon is a suffocatingsubstance. The effects of oxygen shortage due to suffocationmay include fast breathing, reduced mental awareness, muscle coordination defects, wrong sensation, emotional instability and fatigue. If suffocationcontinues, nausea, vomiting, loss of appetite and anesthesia may occur, which may lead to seizures, coma and death. In low-density of oxygen, anesthesia and death can occur in a few seconds withoutwarning. Lack of oxygen during pregnancy has led to developmental malformations in humans and in laboratory animals. First aid measures for gas are not required. If you are suspected to frostbite, rinse your eyes thoroughly with cool water for 15 minutes and take immediate medical care. To relievefrostbite, wet your skin in warm water. Do not use hot water at all. Do not forget medical care. Swallowing occures rarely because the argon is gas at room temperature. In case of inhalation and excessive exposure, immediate medical care is required. The rescue group should be equipped with independent respiratory apparatus. Victims should be guided to a clean area and breathe fresh air. This action is the most important action. Unconcious people should be taken to clean area and if breathing is stopped, do artificial respiration, or use excess oxygen. Additional treatment should be done according to symptoms. Depending on the quantity, different containers are used for storing, transporting and handling liquid argon. Liquid cryogenic cylinders and cryogenic storage tanks and storage volume varies from several gallons to several thousands gallons. Evaporation occurscontinuousely to keep the container temperature cool. The evaporation rate varies depending on the container design and the volume of stored product. Containers are designed and manufactured based on codes and specifications for temperatures and pressures. A typical double wall insulator is shown below. A loose soil cap on the outlet of the pipes blocks the atmospheric humidity and protects the defile, and lets the produced gas from the evaporated liquid to release. The pressure of these types of containers is irregularable. The most common unit for measuring the capacity of a thermal insulation container is the liter that varies from 5 to 200 liters. The liquid argon can be taken from the small containers by pouring, while larger dimensions requires the transfer pipr. Cryogenic liquid cylinders, which are pressure regulating tubes, are sometimes mentioned incorrectly as thermal insulation containers. A cryogenic liquid cylinder is an insulated pressure pipe. These cylinders are equipped with a pressure valve and a blasting dome that protects the cylinders from increased pressure. Liquid containers work up to 350 Pascal pressures and hold capacities between 80 and 450 liters. Argon may be removed either as gas or liquid, depending on the valve used. Note: Liquid cylinders designed for distributing argon gas are equipped with CGA compressed gas accumulation outlets. Proper pressure control devices can be connected. The valves made for removing liquid products are also equipped to standard CGA outlets, but are different from those used for gas removal. This prevents the interference of processes for liquid or gas product. 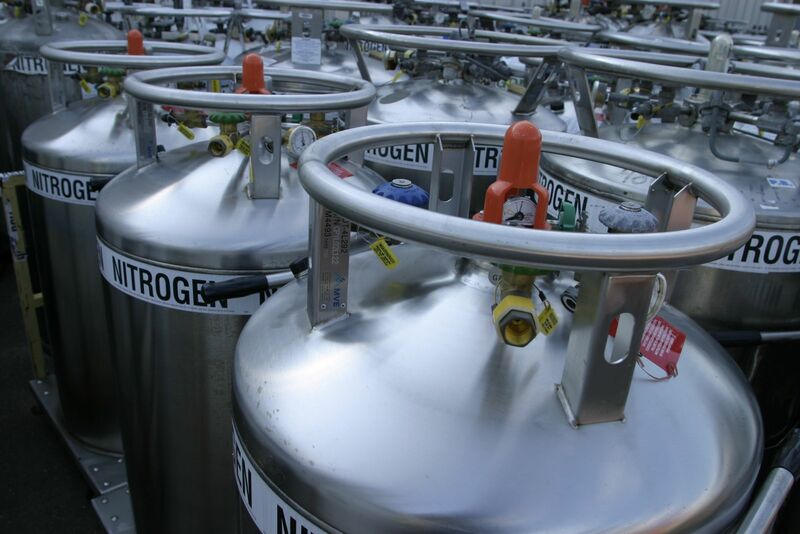 Cryogenic storage devices usually include a tank, a steam generator, and a pressure control unit. Tanks are usually cylindrical and installed in fixed locations. Their size varies from 500 to 420000 gallons. All the tanks are insulated and may contain other separating materials in the circular area. Tanks are designed based on ASME specifications. All argon ladings cool liquid (argon liquids), must comply with DOT rules. This includes car, air, train, and water shipments. In the argon air species, the cool liquid has a limited amount depending on its size. Aquatic shipments must also be in accordance with the rules of the International Maritime Organization. All packages for the transport of argon must have DOT specifications, or DOT permission, and be in good condition for transportation. The federal DOT rules, specifies the following labeling and identification. Pressure reduction valves are used in the cryogeniccontainers. The pressure reduction valve is intended to reduce the pressure, since the pressure is increased in the container to cool the liquid temperature and pressure below the level of the container gauge. Commodities must be operated according to manufacturer’s instructions. Do not try to repair, adapt or change these pipes. If any defect or operational problem is caused for pipes, contact the nearest service center. Argon cool liquid is supplied as a fixed insulation pipe to the customer’s location or as a portable insulating fluid cylinder, put “no smoking” sign or ‘ flammable material” instorehouse. Do not store any flammable or toxic containers in the place of storage. The cylinders should always be kept vertically. Special trucks are required to move them. Do not slip, bend, or hit the cylinder at all.Empty and filled cylinders should not be kept far from flammable products. Protective valves of the container must remain fixed in place unless the outlet of the container to the point of use is tightened with the pipe. If the user finds any problems with the container, discontinue use and contact the supplier. Do not insert anything like a screwdriver into the valve, as it may damage the valve and cause leakage. When you connect the cylinder to low pressure systems, use a pressure relief regulator. Do not heat the cubicles to increase the discharge rate. Use the tuning valve to prevent a dangerous flow to the system. Protect the containers from physical hits. Keep them in a cool, dry environment, with proper ventilation and away from crowded areas and emergency exits. Containers should be stored vertically and firmly in order to prevent falling. Empty cylinders should be separated. Use a “entrance order” system in order to avoid storing filledcontainers for a long time. Cryogenic containers should be equipped to pressure control devices to control the internal pressure by removing the gas.Don’t manipulate any pressure controls. Put the signs of “Do not smoke and do not set the fire”. Storage locations should be selected according to standard 55 (NFPA). The cylinders should always be kept vertically. Special trucks are required for their movement. Do not push, put and slip the cylinders and don’t hit them. Separatefill and empty cylinders from the flammable products. Only use transmission lines and equipment designed for cryogenic fluids. Some elastomers and metals, such as carbon steel, can be crushed easily at very low temperatures. These materials shouldn’tbe kept in a cryogenic service. All the valves are piped to the outside of the building. In liquid systems, the pressure regulating devices should be used in the line where there is a possibility to drain the liquid between the valves. Individuals must be familiar with the features and safety considerations before they begin to work with liquid argon and related equipment. Use chemical protective glasses with face protective cover where the contact with the liquid is possible. Use protective gloves made of suitable materials for work. Also use insulating gloves for refrigeration fluids. Gloves should be clean and free from grease and oil. Safety shoes and emergency eye wash station are recommended. In emergency situations, only trained and qualified people should respond to emergencies. Never use ointment or oil for eyes without medical advice. Do not expose your eyes to hot or even warm water in the case of frostbite or cold burning caused by the rapid evaporation of the liquid. Remove the injured person from sources of contamination, if the person is contacted with small amount of the liquid, open the eyes so that the liquid be evaporated. If the person is contacted to large amount of the liquid, wash the eyes with cold water and low pressure for 15 minutes. Refer the patient to an ophthalmologist for treatment. Cover the eyes with sunglasses if the patient can not tolerate the light. The use of bandages is not recommended because holding eyes closedwill press the eyelid and may result in further damage. For skin contact or frost, remove contaminated clothing and wash the contaminated areas with water and serum. Do not use hot water. If the contact with the substance causes a blister on the surface of the skin or causes frothing in the depth of tissue, a doctor should immediately see the patient. If a cold burning causes a blistering on the skin surface or frothing in the depth of tissue, a doctor should immediately see the patient. In all cases of long term exposure, when argon is inhaling (such as diving), urgent medical treatment is required. Concious people should go far a way from the exposure area and breathe fresh air. Exit from the exposed source or contaminated area is the most important principle. Further treatment should be adopted based on the symptoms. Argon is non-flammable. A cylinder may be rapidly depleted or exploded due to the pressure of the fire. Although most cylinders are designed to remove their contents due to the high temperature, note that the pressure in the container may increase due to heat and may explode if the pressure control device does not work. – Firefighters should wear a breathable protective breath. Cool the chambers until the flames have turned off. Do not spill water directly into liquid argon, because it increases the amount of evaporation and causes waterto freeze. If it is possible, stop the flow of argon that caused the fire. Quickly cool the container with water from the distance. Do not spill water directly into the outlet of the container. If it is safe, remove the uncooled containers from the fire area. Remove all sources of sparks. Use proper protective equipment. Stop the gas flow or take out the cylinder if it is not dangerous. Ventilate closed areas. To increase the amount of evaporation, spray plenty of water in the opposite direction of the wind to the leakage. If there is leakage in the equipment, make sure that you remove the plumbing before proceeding repairs.